It is largely impossible to convey the stimulating feeling I sense as I wander in Shibuya. It isn’t merely an ubiquitous cognitive overload, but also a cultural one: guys and gals wearing impossible clothes, displaying impossible haircuts, posing under the ever-lit neon lights and brand signs in Center Gai, right in front of the local McDonalds, or making their way through the dense crowd to the fashion institution of Shibuya 109, 10 frenetic floors of girl-only clothing shops. 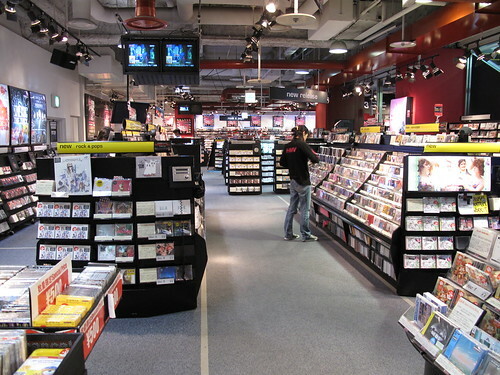 Venturing away from the overwhelming presence of facade turned screens broadcasting a mix of ads and music, I pass by HMV which, like its sister/competitor Tower Records, presents a 6-storey high temple of both indie and mainstream music and videos topped with a cozy cybercafé. I walk along paved streets bordered with various clubs we’d experience later at night, until I reach the more quiet slopes of the hill, covered by thematic love hotels, skirted by a maze of alleys dotted with alternative music and clothing shops, and more tall buildings hosting vertical stacks of cheap restaurants and bars, collections of artsy venues and underground cinemas showing improbable Jean-Luc Godard movies. As I sit in the main Starbucks, sipping a tall Caffè Latte in front of the giant glass bay, and watch the people pouring through the square as a fashionable, international mass, Shibuya doesn’t merely feel like one of the twenty-three wards of Tokyo. It feels like a living organism breathing through people, the crowd pulsing through pedestrian crossings, flowing fluidly in the chaotic yet perfectly organized way so particular to Japan. And it does so all year long, day and night, by sun or rain. When I come out of the station on Friday, it is heavy rain indeed, washing over the city, but as I look at the moving crowd I see the same frenzy as always, unchanged save for the popping of the protective shields, multi-color or transparent, of individual umbrellas, a thin synthetic layer to keep parading under the pouring waters, tones as vivid as ever, fashion flashy, the mood dynamic. Of course, Shibuya is no more “Japan” (or Tokyo) than Amelie from Montmartre is “France” (or Paris). The world of Amelie is a fantasized exaggeration of Paris, clearly too extreme and symbolic to bear any resemblance to the “real Paris”. 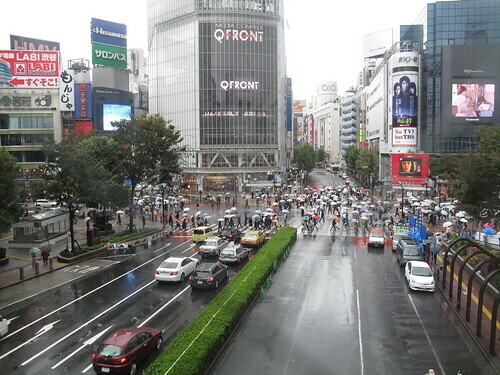 Shibuya, on the other hand, while extreme and symbolic too, is part of our reality. The colorful, exaggerated caricature of Japan it presents can be experienced and walked around in as if, contrarily to Amelie, the consensual dream had been instantiated into the real world. Baudrillard called Disneyland a diversion, celebrated as imaginary to hide the fact that Los Angeles and the United States had themselves become hyper-real, a simulation. Shibuya pushes the metaphor further by merging the diversion with the original object: it isn’t a fake, reassuringly distinct from our reality; it is strongly anchored in contemporary Japan. On the one hand, it is a dream place, hyper-referenced, living in the imagination of people as a special, almost magical entity. On the other hand, it really is this place. Real people go there. I go there; I am there, and there I shop, drink, eat, sing, party, dance. And while it may often look like one, it isn’t merely a carnival either. A carnival is a singular event, celebrated as special, as a break from the everyday life, whereas the surreal nature of Shibuya is quotidian, normal. It is everyday life. Clearly, such ambient postmodernity is not representative of Japan as a whole, except as a metaphor for what Japan can lead to when pushed to the extreme. Yet, although this twisted sense of modern hyper-reality remains specific to Shibuya, it feels like only in Japan could it work so naturally, because of the cultural ability to blend fiction and reality, cultural extremes and everyday life. Here, outlandish images and concepts are not fought as long as they serve their purpose, their role. Unlike the dichotomous West, there seems to be no emotional need to separate the special from the normal. 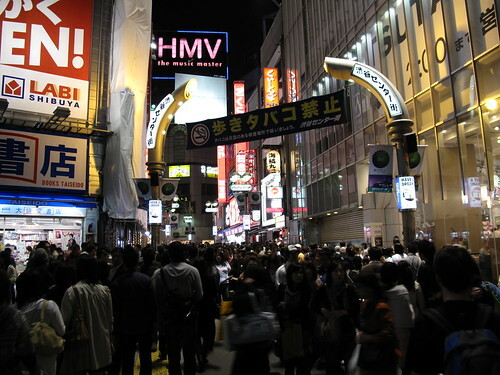 Given enough momentum, groups form and create their own sub-reality, building inertia around their own set of rules and symbols, creating a virtual culture that soon turns real, blending with the rest of society and, sometimes, resulting in a place like Shibuya, which manages to be both a hyper-referenced, celebrated image of Japanese extremes, and the realization of this image. 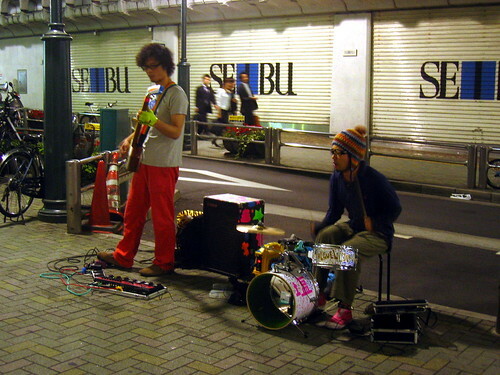 Which is why, to me, Shibuya remains the ultimate hyper-place. 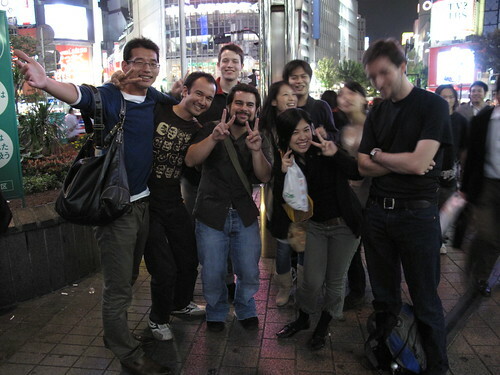 This post closes my gonzo experimentation of describing and analyzing my trip to Japan as I was living it. Hope you enjoyed it. There will be more, someday in the future.